When talking about behaviors we have to distinguish between behaviors of the individual and of the collective. Every single one of us has specific needs which influence our behaviors. And a collective is much more than the sum of its people. Group dynamics kick in, people behave differently in groups. And the same people behave differently in different groups. Think about the language you find appropriate with your family compared to that with your school friends. No, we’re not talking about people presenting fancy underwear in magazines. A model is an abstraction of a specific reality. Usually the reality is very complex, models help grasping this through simplification and focus, ignoring surrounding factors. The benefit from this is that it’s rather easy to understand and it becomes generalizable. Everyone is special and each situation is different. Yet, if we look at it from a distance, the situations appear fairly similar. The downside is, that through this level of abstraction, every model inevitably becomes wrong, an over-simplification. This is important to keep in mind. Models help dealing with complexity, but should always be taken with a grain of skepticism. 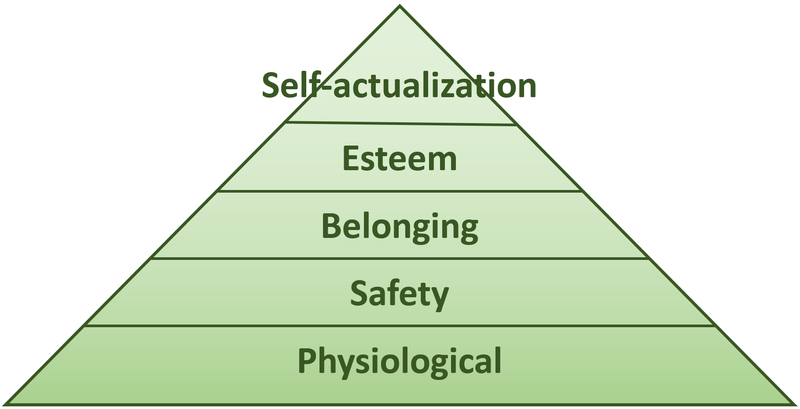 The hierarchy of needs after Abraham Maslow (Maslow, 1943) is widely spread in management literature. Five levels of needs that build on top of each other, hence the common pyramid visualization. You probably have heard about it. Bear with me though, there’s an angle that is often dismissed, but important. Psychological needs, dealing with the survival of the species. We need air, water, food and the like. If our life is endangered nothing else matters. Safety needs, dealing with the health and well-being. We need shelter, safety in regards of illnesses or accidents and everything else that might have a negative impact on our lives. This includes personal security, as in financial or job security, which often are important factors when it comes to team work. Social belonging needs, dealing with our social life. We need to love and to be loved by others, not just sexually. Having social interactions with each other is important for humans, as well as being part of groups. People do crazy things in order to be part of a community. Esteem, dealing with the respect from others. Once we are part of groups, we want to feel respected by the rest of the group. We seek for status, recognition, fame, prestige, and attention. Interestingly enough, this is not limited to the people we respect, but often we want to be respected by people we do not respect ourselves. This level deals with all the peer comparison that we keep doing. For example, when a neighborhood is competing for the biggest car. Self-actualization, dealing with the personal growth. Once we feel recognized for our abilities, we become anxious or uneasy and want to look for more. We want to explore our full potential and thrive and live for our full potential. 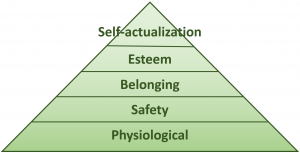 Maslow states that every human being has the same fundamental needs and we basically want to reach a certain level in one level, before tackling the next higher one. If we’re starving, we can’t be bothered with the new smartphone model. This is where the model has its shortcoming and why it is widely critiqued in psychology literature, as it suggests that one thing happens after the next. But this is not the case. Also in war zones people are able to seek for romance at times. So this should be more understood as context-dependent. The clear message of Maslow is though, that every healthy human wants to thrive and develop. This is often overlooked. We all try to reach the next level. Always. And if something is holding us back from reaching this, it might cause frustration of some kind. With this model in mind, take another look at people you think are not performing to their best of abilities. Ask yourself what is the reason behind it. Do they feel secure? Do they feel included? Are they feeling recognized? And how could you support them? It’s probably worth discussing this with the people in doubt. And in these discussions, you might want to use this model for visualization. Absence of Trust. Trust is the foundation of any cohesive team. No one will show vulnerability if there is not trust others won’t use it against them. Fear of Conflict. Conflicts are uncomfortable, but help grow as a team. If you are afraid of conflict, in order to avoid these, you will not challenge one another. Lack of Commitment. The team needs to be clear on what they approach and what not. And sometimes this involves a commitment of people who initially disagreed. Avoidance of Accountability. Not feeling accountable means not accepting the task. Additionally, holding each other accountable shows trust and respect. Inattention to Results. People might not focus on the team’s results but only worry about their individual tasks. The overall goals are often ignored then or out of focus. 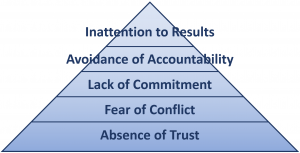 The clear message of Lencioni is, that without trust, there won’t be successful teams. It’s fundamental. Only then will people be able to challenge each other, to hold each other up for their commitments or accountabilities and not until all of those are in place, teams will truly focus on the results. Again, this is a model, and shouldn’t be taken too literal. It’s highly context dependent. Also it would be a philosophical question what fulfilling a stage would mean (What is full trust?). Still, the model helps identifying problems of teams. 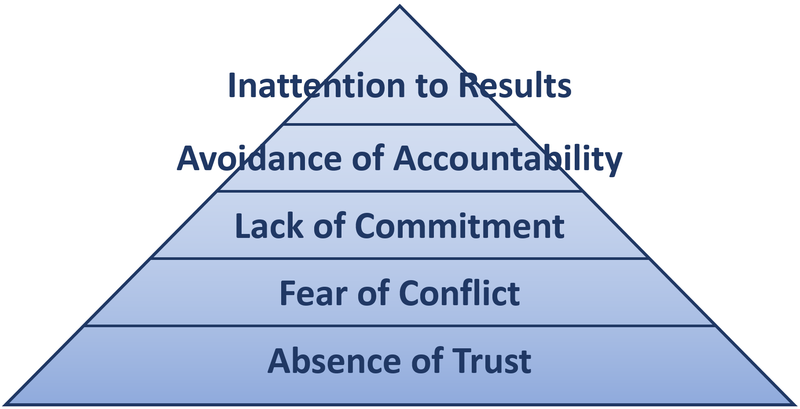 If you’re not happy with the delivery of a team for example, you might want to work your way through the pyramid. Top to bottom. There are also surveys, helping the team assessing their own situation. As you noticed, this text does not deal with solutions, but with identification of problems. That however is the key. It’s not uncommon that we try to fix something, while unaware of the real problem. Often we then deal with symptoms and not with the root cause for all the trouble. But we need to figure out the motives for individual behaviors. A careful analysis in crucial, only then will you be able to find the cure for the disease. Models like the ones above help to get closer to the core. They are pointers into the right direction, not more. If you for example notice, while thinking about the dysfunctions, that there is no trust in your team, you still need to figure out why that is the case. Reasons could involve hidden agendas, the team still being in the storming phase or anything else. This is highly specific and needs to be sorted out for each case individually. There is no one size fits all. Always keep that in mind. We’re all different. And that’s the beauty of it. Lencioni, P. M. (2004). Death by Meeting: A Leadership Fable. San Francisco, California: Jossey-Bass.